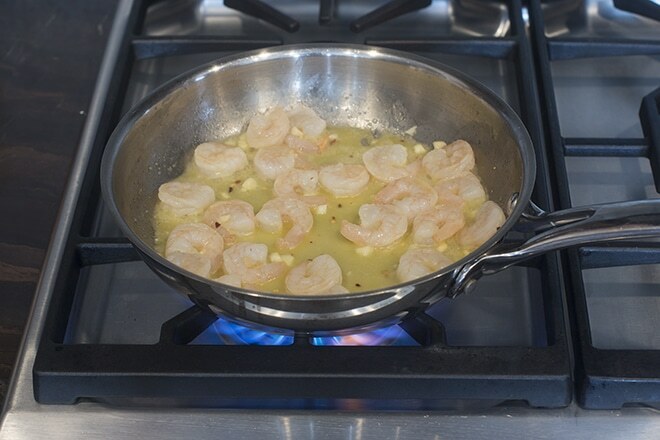 Learn the steps to cooking shrimp perfectly every time with this easy, and delicious, recipe. Shrimp are wonderful. They are fast to defrost, fast to cook, and can be used in hundreds of easy recipes. That’s why they’re so popular! 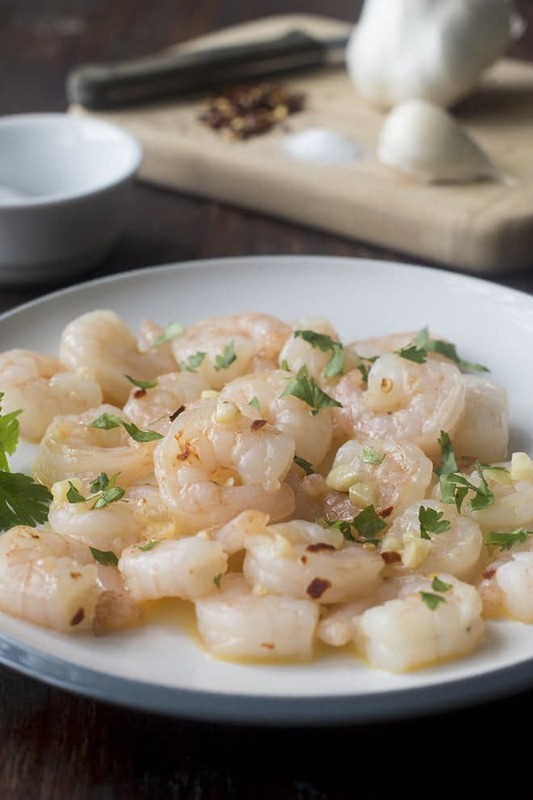 There are a lot of different ways to cook shrimp. It really depends on what you want to use them for. Usually shrimp are sold frozen (and if you buy them fresh, note that they were almost always previously frozen so I’m not sure what the point of buying them defrosted is. But anyhow). So first you need to defrost them. 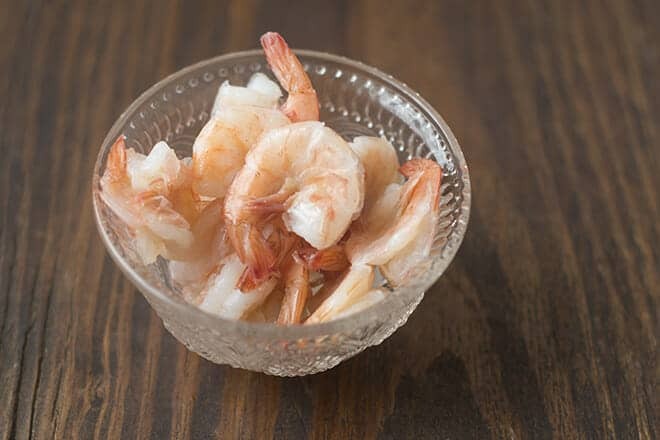 Here’s how to defrost shrimp quickly. Do note that you CAN cook shrimp from frozen. I actually prefer to poach shrimp straight from frozen. They turn out plumper and juicier than if I thaw them first. 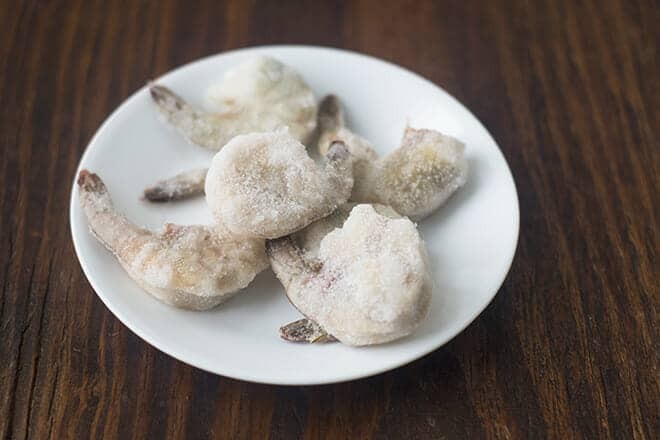 Here’s how to cook shrimp from frozen. This is the best way to cook them for shrimp cocktail. 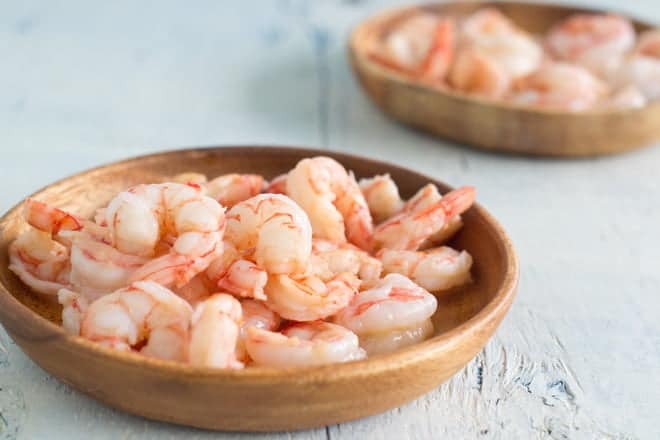 You can also cook shrimp in the Instant Pot. This is a great way to get a really good pasta sauce and tasty cooked shrimp all in one. And, you can even cook shrimp in the air fryer. Who knew! 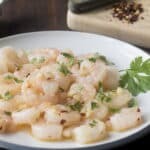 Here’s how to cook shrimp perfectly! 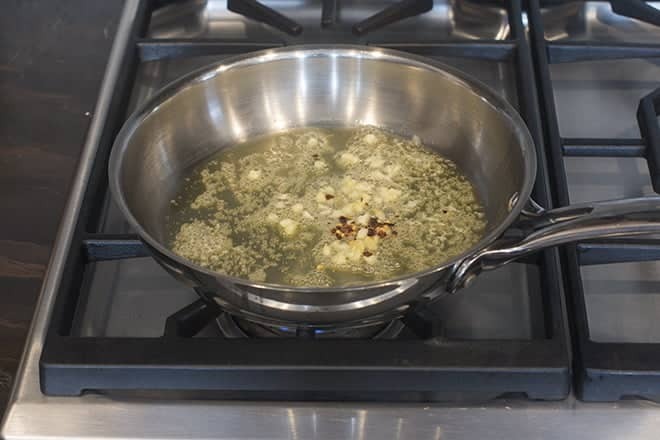 First, start by heating a tablespoon of olive oil and a tablespoon of butter in a skillet over medium heat until the butter melts. Swirl it around to mix it. The oil has a higher smoking point than butter so using them both together like this protects the butter from burning. Reduce heat to low. Add 1 clove of minced garlic and, optionally, 1/8 of a teaspoon of red pepper flakes. Stir and cook for 1 minute. Increase heat to medium-high. 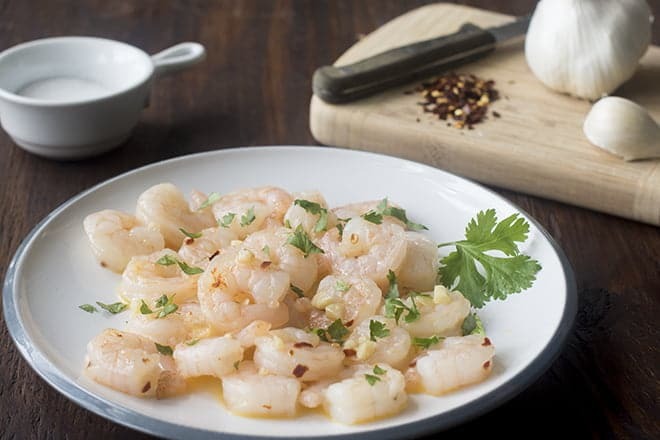 Add 1/8 teaspoon of salt and 24 medium (51-60 per pound) peeled and deveined shrimp. This is about half of a pound and is essentially enough for two people. 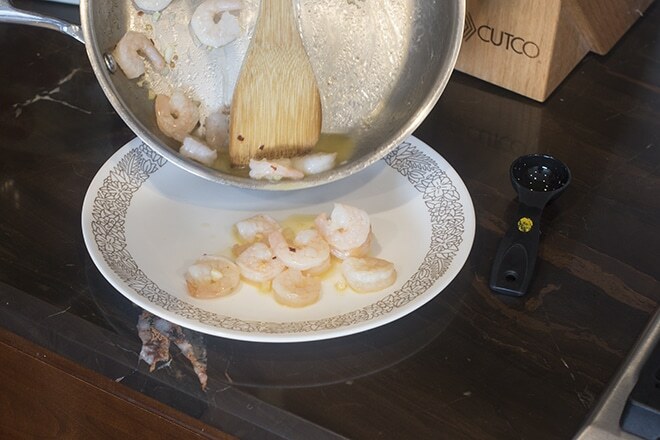 If you use larger shrimp, the cooking time below will be slightly longer. You can also go ahead and use shrimp that are peeled and deveined but still have the tail on them. Those make for a really nice presentation for some dishes. However, I find that the garlic butter on the tail makes it messy for picking up and I therefore prefer to go with no tail for this method. I use shrimp with tails for shrimp cocktail. When I do so, I typically poach the shrimp in hot water. That way the tail isn’t all buttery and messy for when you pick them up. 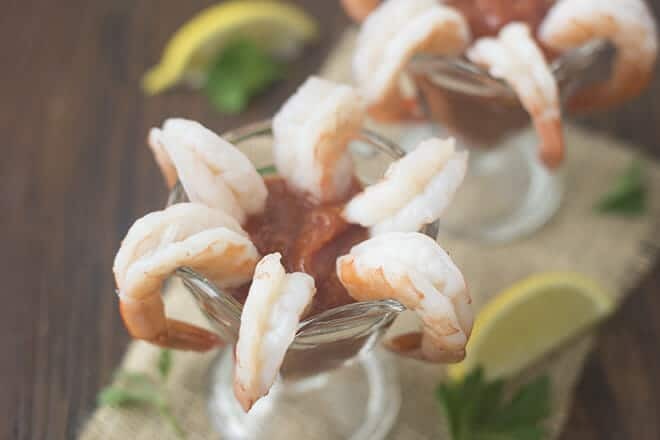 So, if it’s finger-food shrimp, use shrimp with the tail and cook using the poaching method. 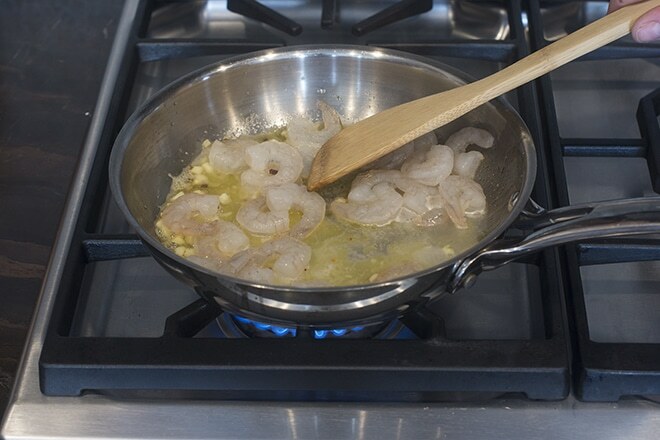 If the shrimp are to be eaten with a fork, use shrimp with no tail and cook using this panfrying method. Stir the shrimp as they cook until they turn pink and opaque, about 2-3 minutes. Transfer the shrimp to a plate. You can use a slotted spoon and then leave the butter behind. Or scoop of the butter along with the shrimp. It’s super tasty. One thing I like to do is to cook pasta and then toss it with the shrimp and butter right in the skillet for a quick dinner. But if you leave most of the butter behind in the skillet, they’ll look like this. Don’t you wish you could dive right into your phone and eat them now? Meeee tooooo! 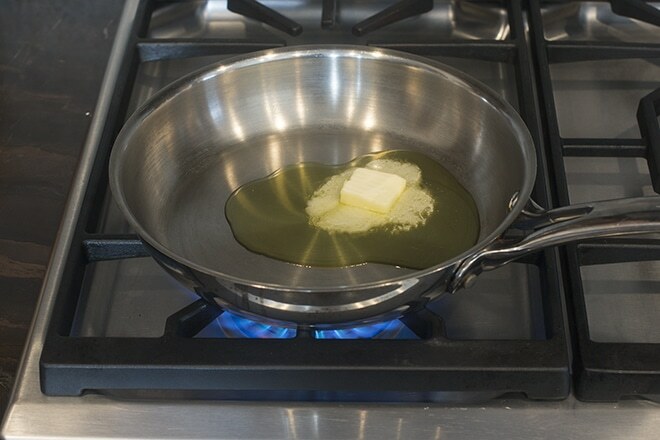 Warm the olive oil and butter in a medium skillet over medium heat. Swirl to mix. When butter is melted, reduce heat to low and add garlic and red pepper flakes. Stir and cook for 1 minute. Increase heat to medium-high. Add salt and shrimp. Stir and cook until shrimp are pink and opaque, 2-3 minutes. Transfer shrimp to a plate. Serve.